A little less than a year after eight students were killed during the shooting attack at Jerusalem's Mercaz Harav rabbinical seminary, a student who opened fire at the terrorist held a brit for his son at the institution on Monday. Yitzhak Dadon named his son after the former head of the yeshiva, Rabbi Avraham Shapira, and the Mohel (circumciser) was the father of Yehonadav Haim Hirschfeld, who was killed in the attack. Chief Rabbi Shlomo Amar, the godfather, said during the ceremony "this brit is proof that we are continuing to live and are not giving up; the Israeli nation will never lose hope." 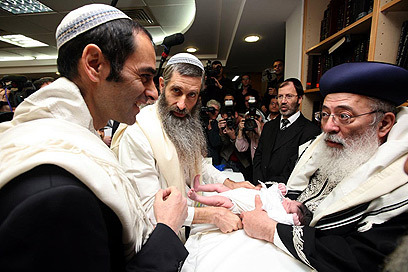 Tzemach Hirschfeld, the mohel, said "this is a very special occasion for me – to circumcise the son of the man who shot the terrorist who murdered my son, and all this just a week before the first anniversary of the attack." Dadon told those on hand that "we hope to gain strength and rise up from the terrible event we experienced here and sanctify life with the blood of the victims." See all talkbacks "Student who opened fire at terrorist holds brit at Mercaz Harav"